North Fork Flathead River rafting trips offer a rare combination of relatively mild whitewater rafting in a rugged alpine environment. The North Fork of the Flathead is located in the quiet and rugged Northwestern corner of Glacier National Park. The North Fork of the Flathead River is mostly Class I-II with a few Class III rapids. 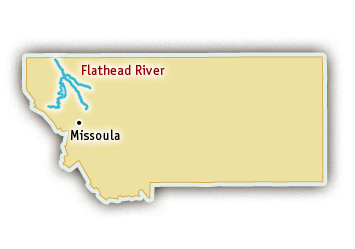 The majority of the Class III rapids are located within a 12 mile section between Big Creek and Glacier Rim, just above it’s confluence with the Middle Fork of the Flathead River. In this section, the river cuts through several mountain ridges. With a steeper gradient and narrower canyon several Class III rapids, such as Great Northern, Upper Fool Hen and Lower Fool Hen are created. There are plenty of mild sections which allow time for viewing wildlife such as eagle, moose, elk and grizzly bear as well as enjoying the spectacular scenery of the Park. 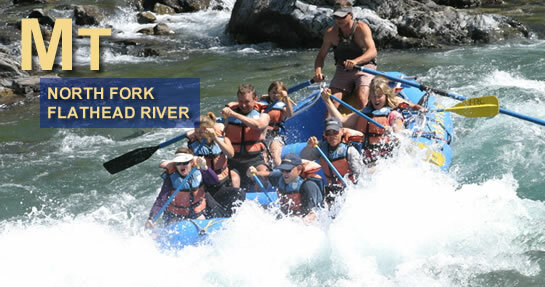 River rafting trips on the North Fork of the Flathead are usually available from mid-May to August on the upper reaches of the river and all summer long on the lower. Glaciers from the nearby Livingston Range feed side streams that flow into the North Fork of the Flathead River. These side streams help to maintain the rivers flow throughout the season on the lower stretches. Peak river rafting flows generally occur between late-May and mid-June.